GLOCESTER -- Dr. Reuben Mason, a surgeon during the Revolutionary War, built the house in 1744. 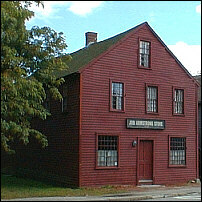 It sits at the footstep of Acote's Hill in Chepachet -- the site of the state's first battle for voting reform in 1842. The Glocester Heritage Society is trying to find money to save the Reuben Mason House: $360,000 to renovate the vacant and dilapidated building, plus $10,000 a year for insurance, said Rose LaVoie, the society's president. "It's a big undertaking, believe me," LaVoie said. "We hope to restore it to what it looked like before." Its white paint is chipping, revealing the building's original red milk paint. The house still has its original wavy-glass windows. In addition to a new paint job, it needs a new electrical system and roof. LaVoie said the society hopes to turn the first floor into a museum, where a Roger Williams University professor will teach people about the history of the Dorr Rebellion. In late June 1842, Thomas W. Dorr was elected governor of Rhode Island on a platform of voting rights. Until then, only white men with $134 worth of land could vote, and Dorr wanted to liberalize the laws. But two days later, Samuel King, under a different constitution, was also elected governor. King and his militia sought and defeated Dorr, who had fled to Chepachet's Acote's Hill, where the fight for voting reform would have to wait for a later time. LaVoie said the association is sending its appeal to save the house statewide, since it can't support the project alone. "This is of town significance but it's also of state significance," she said. "The town has expressed interest in helping out, maybe in terms of services. And of course, everything helps." LaVoie said the association has already applied for grants from the Champlin Foundation and the Gregson Foundation, and there may be a chance that the state will match the grant money. LaVoie said it would be great to restore the house to its original condition. She welcomes donations of memorabilia or furnishings from the Dorr era. "This is another part of our history," LaVoie said. "If we as a people don't support and recognize it, it will be gone. And once it's gone, it's gone forever."